John Henry Roberson, also known as Rube Robinson and Hank Robinson, born August 16th, 18871 in Floyd, AR, was a professional baseball player from 1908-1929. Robinson made his professional debut in the 1908 Arkansas State League with Argenta and Newport. 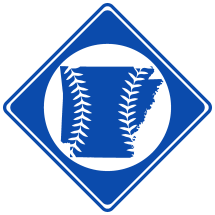 He also played with Jonesboro in the 1909 Arkansas State League, Newport in the 1909 Northeast Arkansas League, El Reno in the 1910 Western Association and Caruthersville in the 1910 Northeast Arkansas League before going on to pitch in higher classifications on baseball. He played in parts of six major league seasons with the Pittsburgh Pirates, St. Louis Cardinals and New York Yankees between 1911-1918. Robinson spent the majority of the rest of his career in the Southern Association with the Little Rock Travelers. had a professional career win-loss record of approximately 329-2393 and pitched an estimated 4942.0 innings.4 Robinson won 190 of his games as a member of the Little Rock Travelers, an all-time franchise record. He was inducted into the Arkansas Sports Hall of Fame in 1962 and the Texas League Hall of Fame in 2011. 1. It's not entirely clear when Robinson was born. Early sources, including the 1900 U.S. Census , 1910 U.S. Census , Robinson's World War I Draft Card and his marriage license , indicate that he was born between 1886-1888. Later sources, including Robinson's World War II Draft Card , Social Security Death Index , obituary, and grave marker all consistently give Robinson's birth year as 1889. However, because Robinson's younger sister Margaret Maradia Roberson Quattlebaum is documented as having been born in February of either 1889 or 1890, it can be surmised that Robinson must have been born between 1886-1888. For the purposes of this page, Robinson's birth year is given as 1887 based on his World War I Draft Card. 2. 1900 U.S. Census. 1910 U.S. Census . 1920 U.S. Census . 1930 U.S. Census . 1940 U.S. Census . 3. Several seasons of Robinson's earliest minor league statistics are missing or imprecise. Based on box scores, it appears Robinson went 7-6 in the 1908 Arkansas State League, 11-8 in the 1909 Arkansas State League, 9-2 in the 1909 Northeast Arkansas League, and 7-0 in the 1910 Northeast Arkansas League. However, the 1909 Reach Baseball Guide credits Robinson with a 9-5 record in the 1908 Arkansas State League and the 1910 Reach Baseball Guide credits him with a 9-3 record in the 1909 Northeast Arkansas League. 4. Inning totals are not available for several of Robinson earliest minor league seasons. However, based on boxscores, it is estimated that he pitched approximately 125 innings in the 1908 Arkansas State League, 180 innings in the 1909 Arkansas State League, 105 innings in the 1909 Northeast Arkansas League, 180 innings with El Reno in the 1910 Western Association, and 72 in the 1910 Northeast Arkansas League. 6. Social Security Death Index. 7. Grave marker at ArkansasGravestones.org.